Honolulu’s Waikiki district may have a spectacular sand-and-surf beach, world-class shopping, and plenty of star-struck tourists, but hip hangouts? Not so much. At least until the Surfjack Hotel & Swim Club opened this year, a short walk from Waikiki Beach. The Surfjack is located five blocks from Waikiki Beach, one block from the Ala Wai Canal. 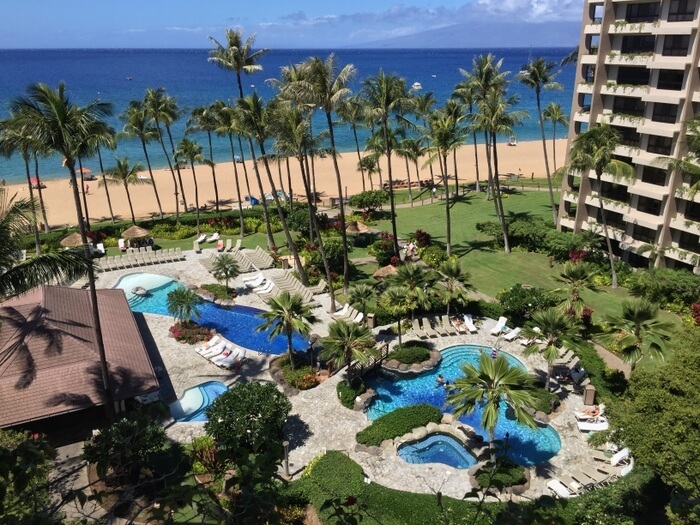 You may not be right on the beach, but the 10-story lodging is built around the pool, with an open-air lobby at one end, a lounge at the other, and Mahina & Sun’s restaurant in the middle. It’s designed to be a social space, where you can sun by the pool, or hang out in the lobby on the long green couch that encourages conversation. You can borrow books or board games, and in the lounge, there’s live music most evenings. 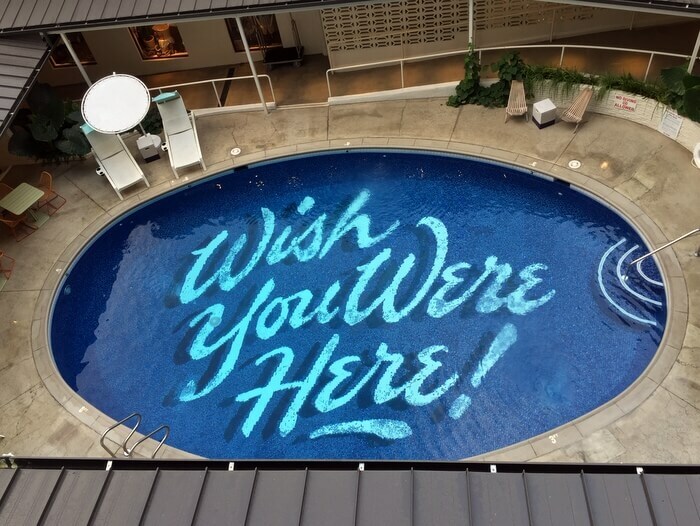 The pool isn’t huge, but it’s certainly eye-catching with its “Wish You Were Here” graphic that local artist Matthew Tapia hand-painted on the bottom. The Surfjack has a “Director of Experiences” (fun job, right? 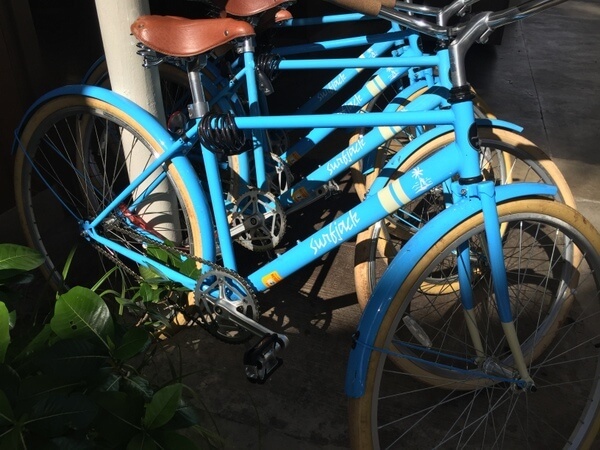 ), who programs different things for guests to do, from lei-making workshops and surfing lessons, to bike rides, bossa nova nights in the lounge, and pilates classes on the rooftop patio. They’ve also launched a unique farm tour program, which takes you to two organic farms on Oahu’s west side to learn about the things they grow and the populations they work with. One farm is entirely run by young people, while the other works with homeless and developmentally disabled individuals. The farms supply vegetables to many Honolulu restaurants, including Mahina & Sun’s. 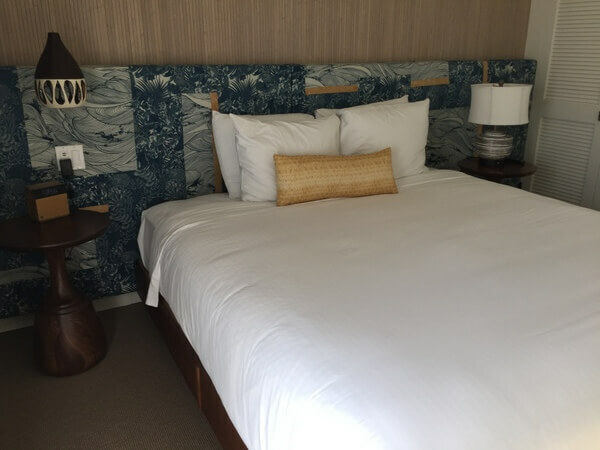 The Surfjack’s 112 guest rooms have a simple Hawaiian style, with print headboards, modeled on a vintage Tory Richards design, accenting the white linens. The carved-wood night tables add to the local feel. Most rooms have a lanai (terrace) with a small table and chairs. All have a mini-fridge but no coffeemakers or tea kettles, though you can help yourself to a cup of coffee downstairs in the restaurant. Other amenities include air-conditioning, flat-screen TVs, and in-room safes. 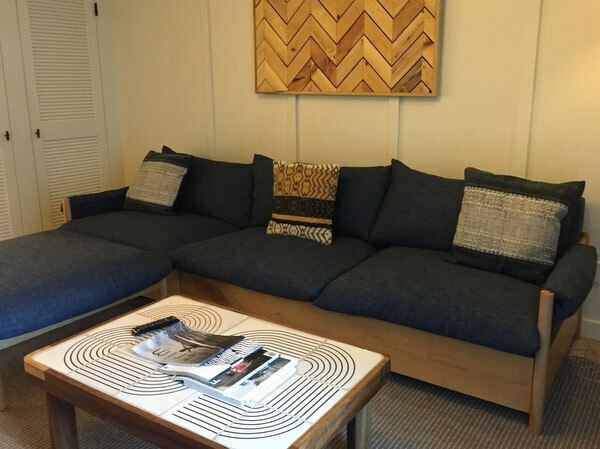 The standard rooms are cozy, averaging 285 square feet. If you need more space, the one-bedroom suites (480 square feet) add a living room with a sectional sofa. Even if you don’t stay at the Surfjack, book a table at Mahina & Sun’s, the contemporary restaurant just off the lobby, with a terrace facing the pool. Run by Honolulu-born chef, Ed Kenney, who’s known for his philosophy “local first, organic whenever possible, with aloha always,” it’s the chef’s first Waikiki location. He operates three other well-regarded restaurants off the tourist track in the Kaimuki neighborhood: Town, Kaimuki Superette, and Mud Hen Water. 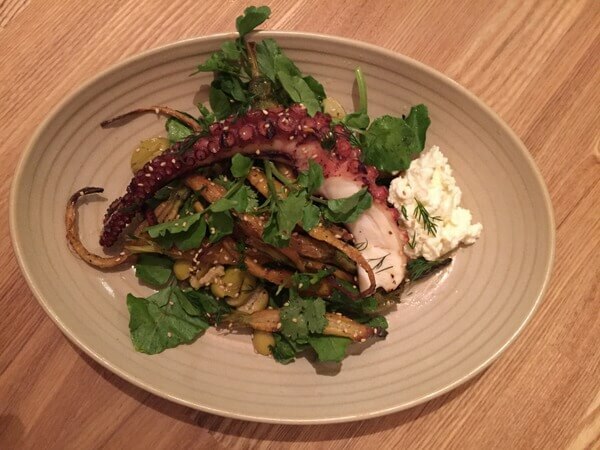 Mahina & Sun’s hews to the same farm-to-table philosophy, creating dishes like airy chèvre beignets with tangy beet ketchup or locally-caught octopus served on a salad of watercress with green olives, carrots, and fresh ricotta cheese. The menu always includes several seafood dishes, as well as a burger, a veggie plate, and a pizza (there’s a happy hour pizza-and-beer special, too). 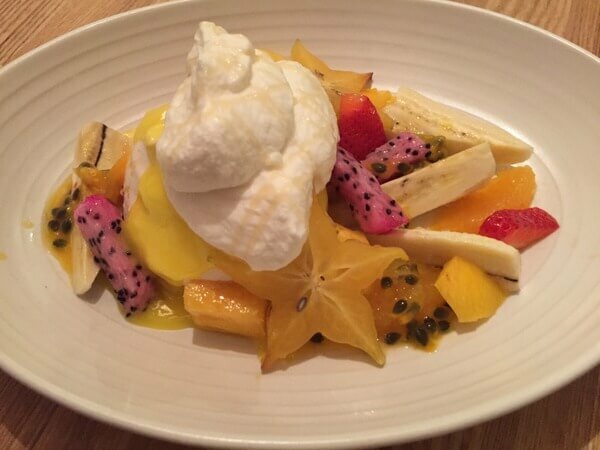 To finish up with a true taste of Hawaii, order the macadamia nut meringue on a bed of tropical fruit. And don’t worry if it’s more than you can eat. The leftovers are equally good as breakfast in bed, upstairs in your cool Waikiki room. Double room rates at the Surfjack Hotel & Swim Club start at $170-230 per night. 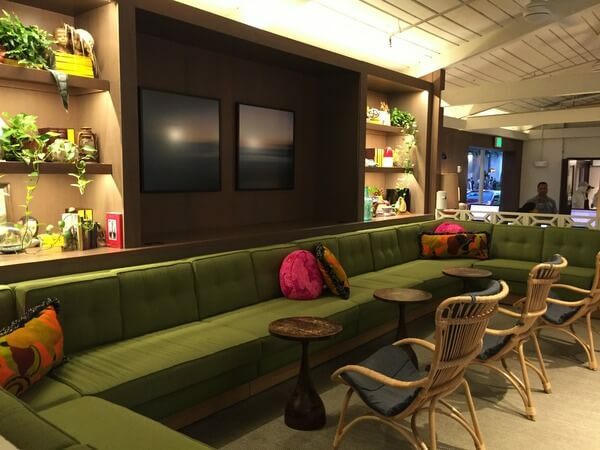 The hotel also charges a $25 per room, per day “hospitality fee” that covers Wi-Fi, local phone calls, welcome snacks, daily coffee, and a local newspaper, and includes a $10 dining credit at Mahina & Sun’s. Valet parking is $35. You can also compare rates and book at Hotels.com or Hotelopia. 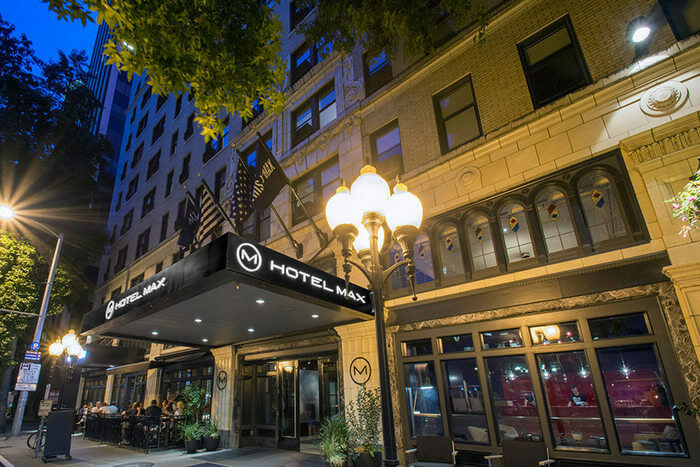 Hotel review by Vancouver-based travel, food, and feature writer Carolyn B. Heller. Photos © Carolyn B. Heller. 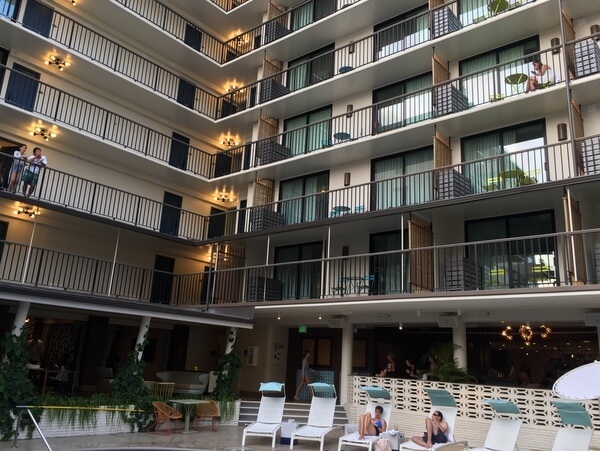 The Surfjack Hotel & Swim Club, in conjunction with the O’ahu Visitors Bureau, hosted my stay for review purposes.